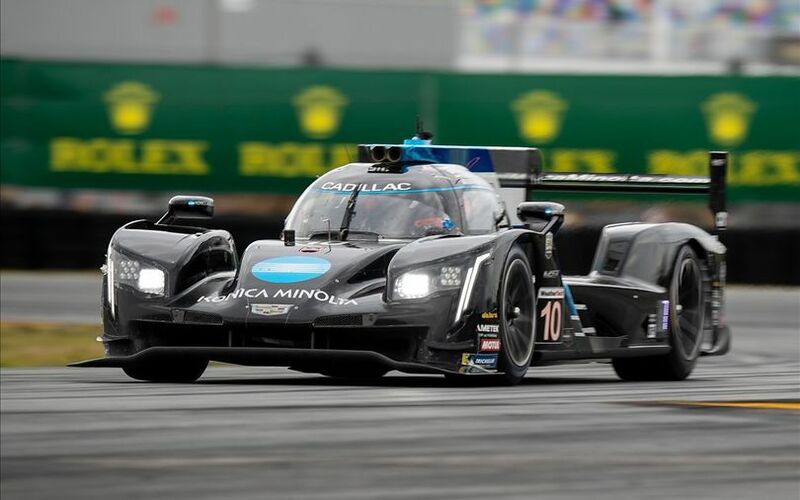 A shortened Rolex 24h at Daytona saw the #10 Wayne Taylor Racing Cadillac of Fernando Alonso, Jordan Taylor, Renger van der Zande and Kamui Kobayashi win the 57th edition of the race. 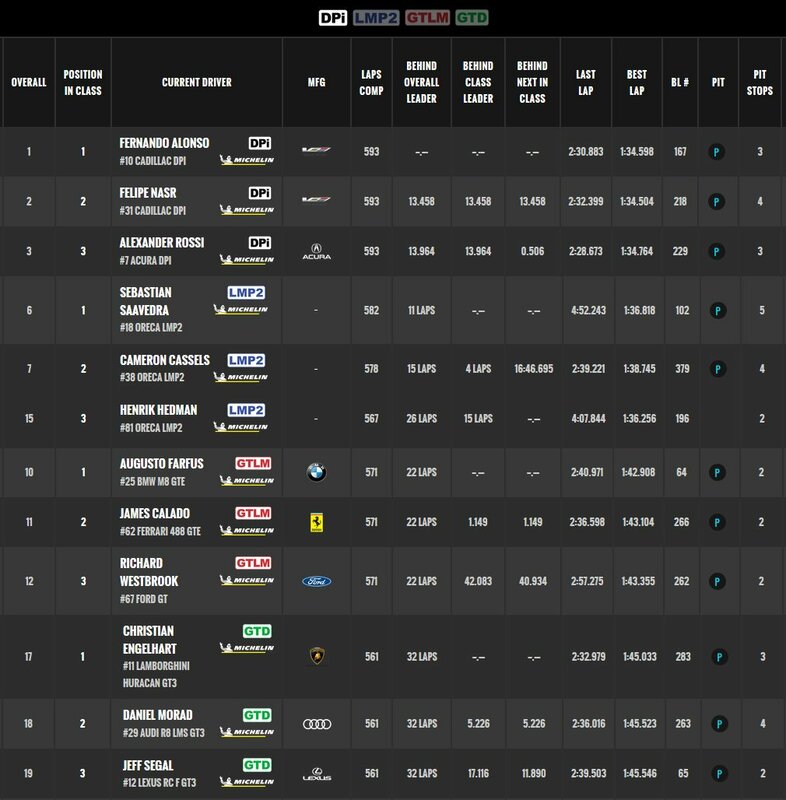 After extensive rainfall throughout the morning & afternoon, the 57th running of the Rolex24 has been deemed official after 23 hours and 50 minutes. It was the first time in the history of the race that it was red flagged twice, first for an hour and 45 minutes on Sunday morning and a second and final time at 12:39pm. The first half of a race saw normal proceedings, but when the expected rain finally arrived, it arrived with serious impact, causing cars to spin and slip off, in several cases aqua-planing off the track and straight into the barriers. In all four categories, it proved to be a tense race, with initially Mazda setting the pace, until they hit trouble, handing the lead to other teams where had been following relatively closely throughout the early stages. Alonso, who only did his second ever Daytona 24h after already competing in 2018 thus became the third F1 champion in history to win the race, following Phil Hill and Mario Andretti. The Spaniard did a solid job and gained praise among commenters for his successive stints overnight which laid the foundation for this win. In that, he was at times more than 2 seconds faster than the rest of the field. This led him to make the pass for the lead and build an advantage. When Alonso was back into the car in the morning, the race was dominated by his fight with Action Express Racing's Felipe Nasr. The two were side by side for nearly half a lap in a final fight for the lead in the morning, until Nasr went wide in Turn 1, essentially giving away the win as the subsequent red flag was set to shorted the race. While Alonso soon praised Wayne Taylor Racing for the race, dubbing the week "a perfect execution of the race", the favour was rapidly returned by team boss Wayne Taylor: "Just everything, all has to come together, having these guys – I took nine months to get [Alonso] to agree! I have to say thanks to Zak Brown [McLaren CEO] for making this happen.